Crystal is a Miniature Schnauzer that came to Safari having bouts of diarrhea and vomiting for months. We diagnosed her with Inflammatory Bowel Disease (IBD) and tried her on a variety of medications to help with her symptoms; however, nothing was working or having a lasting effect. IBD occurs when a part of the gastrointestinal system becomes inflamed because the dog’s own immune system is attacking itself. 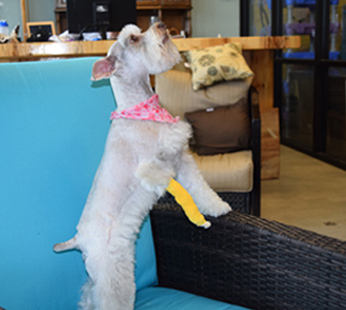 Having no luck with the medications, Crystal’s owners decided to give stem cells therapy a try. She received two intravenous (IV) stem cell injections, within a month of each other. Her owners reported that Crystal has no not one bout of diarrhea or vomiting since the first round of stem cells! (IBD) in dogs and cats is a broad term that covers various chronic conditions of the gastrointestinal system that tends to affect the middle aged and older. Inflammation of the lining of the stomach, small intestine, and/or colon is thought to be an abnormal response by their immune system, a hypersensitivity to gut bacteria, or even food allergens. Your pet can be treated with stem cell injections, too! With one or two stem cell injections they can be resolved of their issue, returning things to normal.